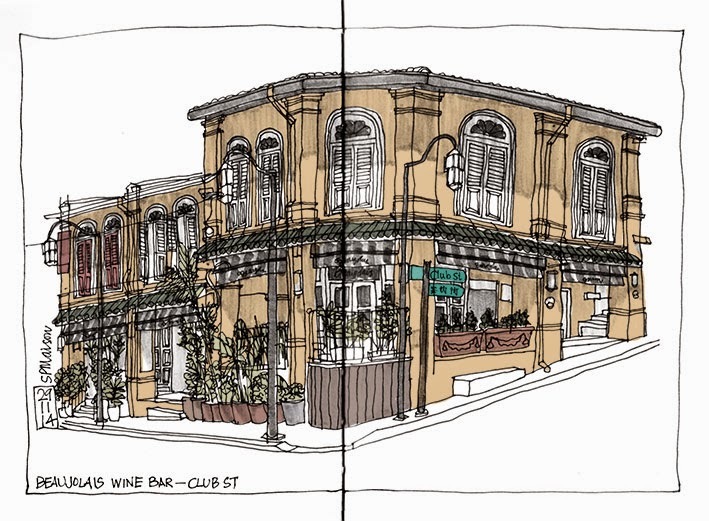 It's been a while since I've been sketching in Chinatown. I intended to go to one of the back alleys where there there are hundreds of air conditioning units but it would have meant standing in direct sunlight for a couple of hours. Rather than turn into a pork scratching, I found a shady spot opposite the Beaujolais Wine Bar at the end of Club Street. The slight mustiness of late-night bars was being overwhelmed by the waft of warm croissants that were baking somewhere in the vicinity.